Immigrants have served with honor in the U.S. armed forces since the Revolutionary War. But in what is believed to be a first, the Army has crowned as its top soldier and an enlistee who was not a U.S. citizen at birth. After serving a tour in Afghanistan, Shrestha earned the right to participate with eleven other soldiers in the Army’s prestigious Best Warrior Competition. Over four days last month, competitors endured a range of tests both physical and mental—including searching for roadside bombs, completing written and oral exams, and performing first aid on wounded comrades. To prepare for the competition, Shrestha, who is stationed at Fort Bragg, NC, studied the Constitution, memorized Army regulations, and had his wife constantly test him with flashcards. He was announced as the winner October 22 at a meeting of the Association of the United States Army. 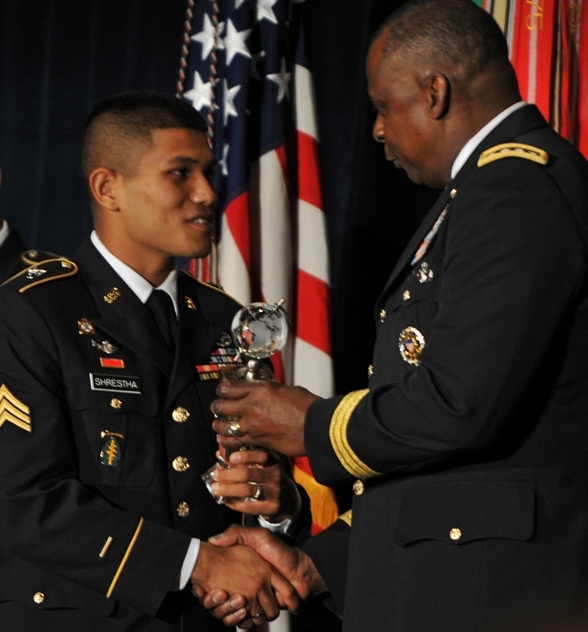 Shortly before Shrestha was named Soldier of the Year, the Pentagon announced it would resume enlisting immigrants under the program—known as Military Accessions Vital to the National Interest (MAVNI)—through which he was recruited. (Although the initial group of recruits performed higher on entrance tests and had lower attrition rates than native-born soldiers, the program was not immediately renewed due to security concerns following the shooting at Fort Hood, Texas.) According to a story in the New York Times, the program will recruit 1,500 soldiers annually for the next two years, with a focus on dentists, surgeons, and trained psychologists. For immigrants, a prime benefit of the program is the ability to naturalize after completing basic training—although they can lose their citizenship if they fail to complete a designated number of years in service. Although Shrestha will soon be eligible for discharge, he reportedly has no plans to leave the Army. He instead hopes to obtain a master’s degree in computer science, attend officer training school, and become a member of the Army’s Special Forces.